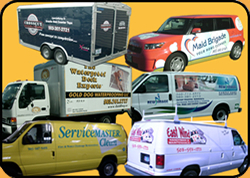 The most cost effective form of advertising in business is on your vehicle. An average vehicle can experience 16 million visual impressions in a single year. Whether you are a company with one vehicle or a large fleet, let Hollywood Signs and Graphics help you take advantage of this exciting medium with simple lettering to complete vehicle wraps.